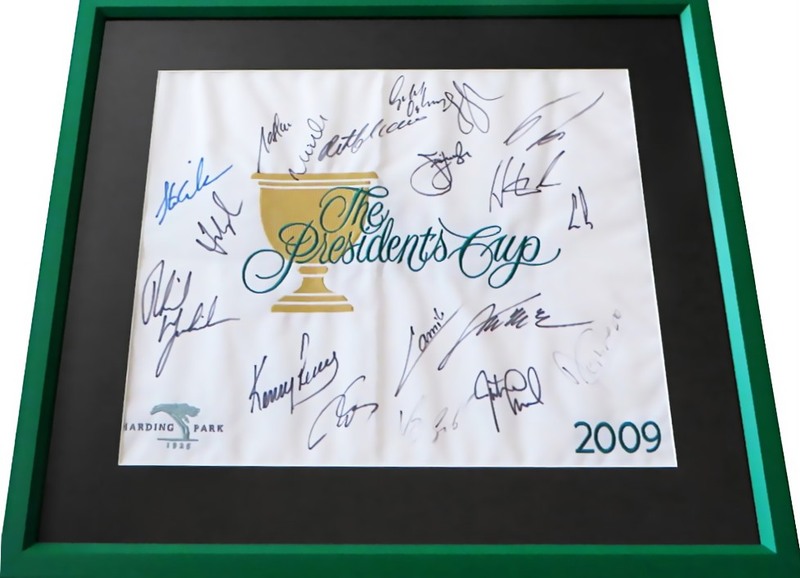 2009 Presidents Cup embroidered golf pin flag autographed by 19 participants, matted in black and framed with glass in green wood, ready to hang. The flag is signed by: winning United States Team Captain Fred Couples and players Phil Mickelson, Hunter Mahan, Sean O'Hair, Lucas Glover, Stewart Cink, Kenny Perry, Jim Furyk and Justin Leonard; International Team players Mike Weir, Ernie Els, Vijay Singh, Robert Allenby, Angel Cabrera, Camilo Villegas, Ryo Ishikawa, Geoff Ogilvy, Retief Goosen and Y.E. Yang. Framed size is about 18 1/2 by 21 1/2 inches. 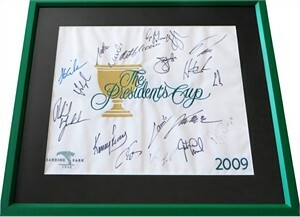 All autographs obtained in person at various Southern California PGA Tour events, with certificate of authenticity from AutographsForSale.com. ONLY ONE AVAILABLE FOR SALE.